The account to access Sciences Po’s online tools (Google G Suite, Moodle, WiFi, library, etc.) is automatically generated. Good to know: you can use WiFi to connect to the Internet and your email account on your own computer in all Sciences Po buildings. You can also access it from any Sciences Po website: on the menu at the top of the page, select the “Faculty” tab, then click “Faculty Account”. your 9-digit ID number—this is provided by the programme secretary and appears on your faculty card. your password, composed by default of the last 6 digits of your faculty number. 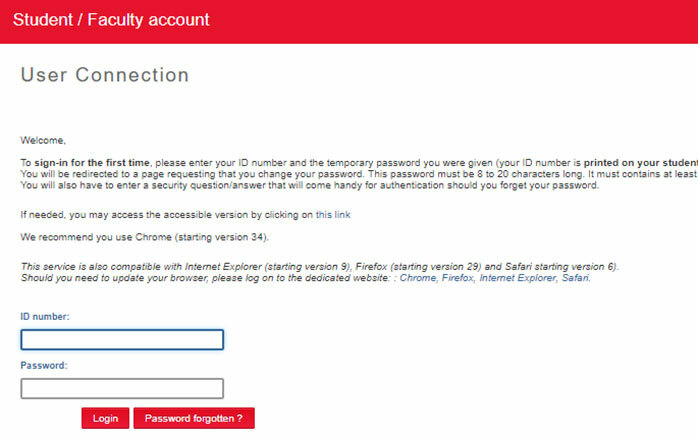 When you log in for the first time, you are asked to change your password and enter a secret question to recover your password if you forget it. In the faculty account, you can consult the list of students and student photos, enter student attendance, marks and availability, and read the students’ evaluations. Find out more about managing the student group. Training sessions are offered throughout the year on how to manage your student group, student lists, student photos, class timetables, attendance, marks, etc. Google G Suite facilitates communication with students by automatically generating a “course group” that can be used for sharing materials and group work. The members of this group are the instructors and the students registered for the course. Need some training or support? Training sessions are offered throughout the year on how to use the email, store and share documents, use the calendar, etc. Moodle: learning activities, sharing documents, self-marking MCQs, submitting coursework, forums, etc. With the Moodle online platform, you can provide students with structured learning material (videos, audio recordings, text documents, etc.). You can also organise learning activities: self-marking multiple-choice questions, surveys, submission of written work, blogs, forums, wiki, etc. Instructions about resources or course organisation can be indicated on Moodle. Training sessions are offered throughout the year to help you get up to speed on using the platform and its functionalities. The Urkund system is a tool to detect plagiarism (PDF, 59 Ko) in work submitted in electronic format. To use the software, students must send their work in text format from their Sciences Po email to the instructor’s Urkund address (firstname.lastname.scpo@analyse.urkund.com). This address is preconfigured in the Google G Suite contacts for each student enrolled in your class. The document is stored and analysed on the Urkund server. All documents are checked against three types of “comparative corpus”: the Internet, published material (books, magazines, press) and texts previously submitted by other students (more than 33 billion documents). The Khartis system makes it possible to create maps using your own data in a few clicks. It was designed and developed by the Sciences Po Cartography Workshop with IDEX funding. Introductory workshops are offered to instructors: contact the Cartography Workshop. The Sciences Po Digital Experimentation Centre offers instructors the use of a soundproof booth, the “E-learning box”, where you can independently create educational audio recordings in three clicks, with or without video and with the possibility of inserting resources. To use the booth, simply reserve a time-slot. You can also ask for support in producing your teaching material.